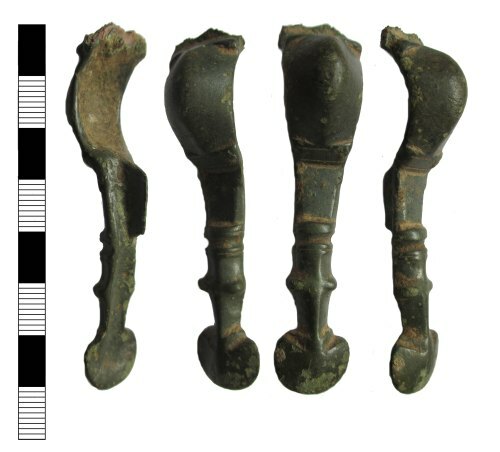 An early Anglo-Saxon copper-alloy narrow cruciform brooch in good condition, but recovered in two adjacent parts due to a recent break between the head and bow. It has an integrally cast facetted half round top knob above a rectangular head-plate, but the two side knobs are missing. The head plate is decorated with punched circles all around the perimeter. Nothing remains of the pin bar lug on the reverse of the headplate, though a rough area may suggest soldering where it was attached. The bow is D-sectioned with a smooth domed upper face and, at top and base, a rectangular panel forming facets and decorated with two transverse grooves. The foot has twin horizontal lines framing a panel with a notch in either side, above a plain panel, and on the reverse of this is a deep catchplate with the rolled edge missing. A single raised rib separates this panel from the horse-head terminal, which has prominent oval eyes and nostrils represented by a smooth convex circular face below angled notches on both sides. The head part is 22mm long, 20mm wide, 4mm thick and weighs 3.53g. The bow and foot part is 65mm long, 15mm wide, 15mm thick and weighs 15.20g. Assembled together the brooch is 83mm long, 15mm wide, 15mm thick and weighs 18.73g. Mid to late 5th century.